North view of Sattarah. Plate 7 from 'Eight Most Splendid Views of India, sketched by an Officer in the Indian Army', published by Baron A. Friedel, London, 1833.
bl.uk > Online Gallery Home	> Online exhibitions	> Asia, Pacific and Africa Collections	> North view of Sattarah. Plate 7 from 'Eight Most Splendid Views of India, sketched by an Officer in the Indian Army', published by Baron A. Friedel, London, 1833. 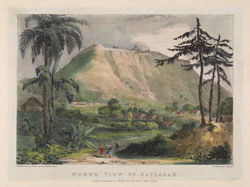 Coloured lithograph of the fort at Satara in Maharashtra by J.H. Lynch from an original sketch by Baron Adam Friedel. Plate 7 of 'Eight Most Splendid Views of India, sketched by an Officer in the Indian Army' printed by Baron A Friedel in London in 1833.